It's A Holly Jolly December At All Slots: Free Spins, Promo Bonuses, Cash-back And More. It's a Holly Jolly December at All Slots! Deposit 50 credits and get 25 free spins on All SLots featured holiday slots Deck the Halls and Santa's Wild Ride! The offer is available on both the Viper download casino, and the Flash instant-play casino. 1,000 credits in daily bonus giveaways to loyal, active players of All Slots. The casino is treating their loyal, active players this week, so be sure to deposit and play for your chance to be a winner. Come out a winner with 10% back on your losses, if any. If Lady Luck doesn’t give you the holiday win you were hoping for, AllSlots will give you another chance with 10% back on your losses. To qualify, just deposit and play 50 credits or more on slots on December 26th-28th, and get up to 50 credits back if you don’t beat the house. Play to win your share in an explosive New Year's draw! You’ll earn an entry to the draw for every 50 credits you deposit and play at All Slot this weekend. The more you play, the better your chances of winning! Top 10 players get 500 credits each, next 25 players - 100 credits each, next 50 players - 50 credits each. 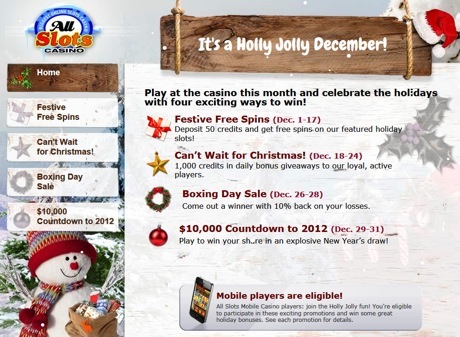 All Slots Mobile Casino players: join the Holly Jolly fun! You're eligible to participate in these exciting Xmas promotions and win some great holiday cash bonuses on the go. Have a great Christmas and a Happy New Year! Get 100% match bonus, up to 200 credits in your currency, with your first deposit at All Slots Casino! Plus, All Slots is giving players 10% cash back on every purchase, up to 450 bonus credits per month! This means you can receive over 5,000 bonus credits a year!